Ski area ads showing cowboys on horseback riding through deep powder in a glade of aspen trees sum up Steamboat Springs fairly well – it’s a ranching town and a ski town. 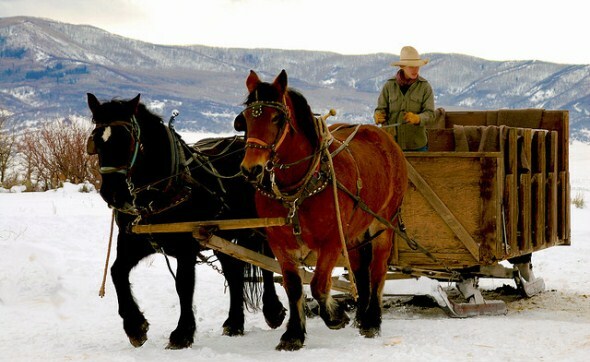 Steamboat’s first settlers were ranchers, drawn by the prospects for agriculture as well as the mineral hot springs that had drawn the Ute tribe to the area, and ranching was long the economic driver because Steamboat lacked the gold and silver deposits that brought booms to places like Aspen and Telluride. Prospectors, however, did find coal, as happened in Crested Butte, and that provided a second leg for the local economy. Skiing came early to Steamboat Springs, with a Norwegian immigrant building a ski jumping hill in 1914 that became part of the oldest ski area still operating in the state. But the skiing boom that gave the industry a major role in the local economy began in 1963 with the creation of the Steamboat Ski Area, which has steadily expanded over the years to become one of Colorado’s major ski resorts. Steamboat’s recreational opportunities go well beyond skiing. Hunting and fishing have long been popular in this ranching community. Mountain biking, rafting, kayaking, and other outdoor sports have become increasingly popular in recent years. Steamboat’s ranching and skiing traditions come together in the Winter Carnival, which began in 1914 as a way to help residents cope with cabin fever and became a celebration of winter each February on ski slopes and in the middle of the town’s main street. There are skiing, snowboarding, and ski jumping events on the mountain. The carnival also features a parade with the high school marching band performing on skis and events with kids on sleds being towed by dogs and dads and kids on skis being towed by horses, all on Lincoln Avenue. The festivities conclude with a fireworks display and the Lighted Man. A key sight on Main Street is the century-old Western wear store F.M. Light & Sons. Numerous yellow road signs herald the store as visitors head into town. Founder Frank M. Light came to Colorado in 1905 from Ohio with his wife and seven children. He noticed that the town lacked a shop selling men’s clothing, and with backing from other local businessmen he was able to open his store just a few months later. In the difficult years of the Great Depression, he lost most of his money. But with his sons Olin and Clarence, he took the store on the road in panel trucks filled with merchandise. Their marketing expertise also generated hundreds of the yellow signs on all roads leading into Steamboat. The family’s fifth generation is now in charge, and the yellow signs that remain are considered historic. Land area: 10.1 square miles. County: Routt (Steamboat Springs is the county seat). Altitude: 6,732 feet above sea level.